Price is a significant advantage for cabin grade flooring. Sold at $0.89 to $1.19 per square foot, cabin grade flooring may be 50-percent less than the manufacturer's standard price. Because cabin flooring contains more irregularities, however, purchasing more than the amount you expect to need is advised. In addition to coming with no warranty, cabin grade flooring describes the appearance of the hardwood and includes an abundance of natural marks. Often cut from the outside of a tree, unfinished cabin grade flooring is characterized by visible knots, mineral streaks, and color variety. Regardless of name, however, cabin grade flooring may also have splits, checks, or windshake in the face of the hardwood. Poor milling, on the other hand, is another factor that may put a hardwood into a cabin grade category. Features of poor milling can include voids on bottoms of boards, tree bark edges, missing tongues, and uneven edges. Without a square shape, such flooring can be difficult to install and may result in an uneven surface for your floor. Prefinished flooring is also available as cabin grade. However, because grades for prefinished hardwood are descriptive only, "character" and "cabin" grades are not standard. If you find prefinished flooring with a "character" grade, the wood was likely distressed by the manufacturer, and even with visible knots and streaks, this hardwood costs more than factory seconds. "Cabin" or "tavern" usually describes #3 common prefinished flooring. Generally, prefinished flooring is labeled "cabin" before a finish is added, but this is not always the case. Finished wood may not meet a manufacturer's standards and, as a result, is sold as cabin grade flooring. 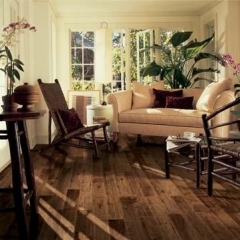 Cabin grade laminate and hardwood flooring is difficult to find. Although popular lines include The Timberland™ Collection by Bruce Hardwoods and Hartco and Robbins products by Armstrong, retailers rarely offer #3 common flooring. Even when sold at a distributor like Hurst Hardwoods, cabin grade flooring varies in selection and is typically determined by monthly lists from mills stating which species and types are being sold as #3 common hardwood.